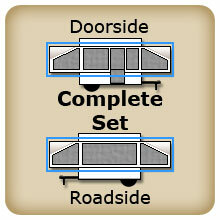 Sunlite Canvas Replacements will make your trailer look new. Manufactured using OEM patterns and material on most new tops. The 10.38 ounce canvas meets or exceeds industry standards. Whenever possible we use material made in the USA. The windows are made of tinted 12-mil vinyl to help keep out excess sun and heat. Screening on the windows is a tight 18x16 mesh to help keep insects out. A durable 13-once vinyl material over the bed wings helps ensure a dry and enjoyable camping trip.